No matter how busy I am, how many projects I'm in the midst of, I always, always have a book to read. I read around two hours a day - on my commute, during my lunch and often before falling asleep too. Last week I did little else but read The Great Gatsby - I just couldn't put it down. I picked up this gorgeous hardcover on a recommendation from a coworker who knows my love of beautiful books. Plus, I had just seen the preview for the movie starring Leonardo DiCaprio, so I couldn't resist. The movie looked good, but if I'm going to watch a movie-based-on-a-book, I have to read said novel first. Do you do that too? First off, F. Scott Fitzgerald is a great writer. I love his use of words and metaphors and his phraseology. Often when I'm reading an older book I get lost in the writing - they just aren't as easy to follow as contemporary literature. But this was different. Fitzgerald is very readable despite (and because of) his wide vocabulary. In fact, his vocabulary really enlivened the story and made it that much more rich. Speaking of rich, this is a tale about the rich in the 1920s and 30s. When Fitzgerald first wrote it, there wasn't a lot of appeal for The Great Gatsby - mostly because it doesn't glorify the decadent lifestyles of the affluent, as the public preferred at the time. I found it to be an intriguing look at the lives of the crazy-rich. I would definitely read this novel again and I'm looking forward to those short stories (there are ten included in this lovely hardcover). First off, let me just say. I love the style of the 20s. Second, I always want to read the book first too, because there is really no going back. Read Life of Pi last summer because of the movie coming out. Third, that is a beautiful hard copy. Think I may have to give it a read too. 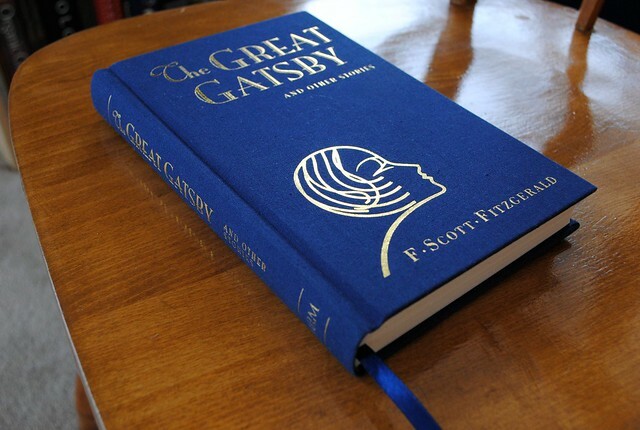 I am reading The Great Gatsby too for the same reason..
How can I buy this particular hard cover of this book?